Most of the Electronic Health Records (EHR) software vendors say that their systems offer interoperability with other healthcare information software systems. All these claims can completely be true or maybe in some cases partially true. EMRFinder reveals interoperability capabilities at 3 high-profile EHR/EMR software vendors. These vendors are Epic, drchrono, and eClinicalWorks. Health system to health system is the most basic type of interoperability, to coordinate care for a patient across organizations. Any healthcare facility or practice using Epic EHR can share its instance with other providers in the community. The patient’s record is on one shared database. Community healthcare providers can access the patient charts via a patient portal so that they can follow the patient’s care across the health system, schedule appointments, place orders, send notes, etc. This is what people usually think of as interoperability. When a patient shows up for care at a health system using Epic, Care Everywhere directs requests to other health systems, receives the standardized summary (C-CDA) and integrates the new data within the patient’s record. The facility that is currently seeing the patient can send the standardized C-CDA summary to another facility. This is best used for referrals. Interoperability is extremely important, and its scope has expanded as the technology, and use of appropriate data sets, has evolved over the years. In the past, being able to communicate with subsidiary systems, pharmacies and clearinghouses required special effort, but now such integrations are out of the box if you are using eClinicalWorks EHR software. eClinicalWorks’ EHR and Practice Management (PM) software is as interoperable as the technology allows it to be. It supports direct interoperability to address gaps in transitions of care. 500,000+ transactions occur per month through the eClinicalDirect HISP. It eases the flow of information and improves query-based exchanges. 1,000,000+ documents are exchanged per day by eClinicalWorks practices through CommonWell and Carequality. 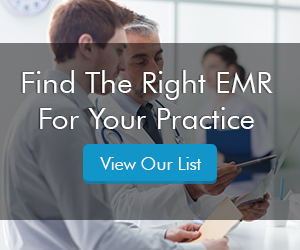 drchrono EHR software is dedicated to a culture of invention. Its mission is to form an open platform where developers, customers, patients, educational institutions, researchers, etc. can get their data, plug an app into drchrono or work with another EHR software vendor. For patients, drchrono has almost 3% of the U.S. population in drchrono software and has a patient health record that empowers patients, to for example messaging their doctors and schedule appointments. On the patient Electronic Medical Records (EMR) software side, drchrono has an FHIR API for developers and partner apps.